In a few hours we’ll be on an airplane to begin the long trip back to the States. It has been yet another amazing visit here filled with hard work, good friends, and fun activities. I’m ready to sleep in my own bed, to eat American food, and to hug my family again. But I always leave Kampala with a twinge of sadness. It’s always hard for me to leave children who are waiting for families of their own. The news has been filled lately with arguments about the pros and cons of international adoption. Very tragic stories have been center stage, and these stories have left some people wondering if international adoption should happen anymore. Certainly, there have been problems with the system — both in the States and abroad. That’s part of why I visit Uganda twice each year — to ensure that our team follows proper legal and ethical requirements as we advocate for children. But each time I meet with orphaned children, I know that we must continue in this important work. Where systems are broken, we must fix them. But we mustn’t be discouraged from the pursuit altogether. There are children who desperately need families. It is always our desire that children can find forever families within their own countries. When that is not possible, it is our joy and privilege to advocate for them here in the United States. We do this because we believe that children do better growing up in families than in institutions. We do this because we believe that the possibilities and promise that are ours as a birthright are meant to be shared with those in need. We do this because we believe that no child should be left alone, without the unconditional love and acceptance that a family can give. 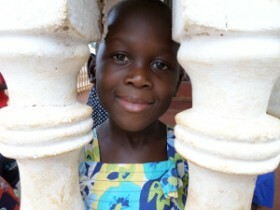 It is hard to leave Uganda, knowing that I am leaving children who are waiting for families. I hope and pray that they each will find homes where they are safe, loved and accepted. Insofar as Agape Adoptions is part of that story for them, it has been our honor.